I believe I have finally unlocked the Match Engine to produce realistic yet effective and beautiful football, Sarri style. This is my sincere approach to a realistic interpretation of Sarriball﻿﻿. I may have cracked Sarriball. Beautiful realistic football. 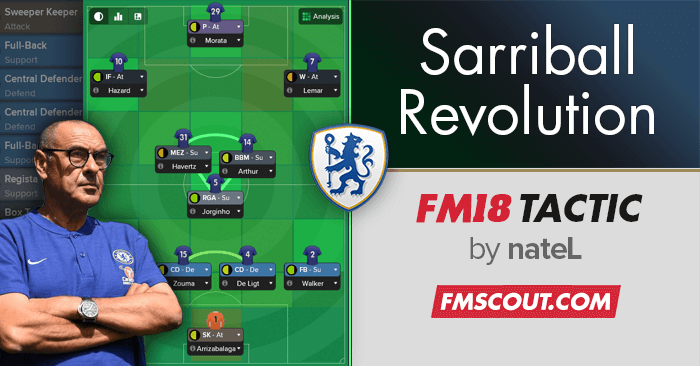 I am a﻿n avid Chelsea fan and I am fascinated by Sarri's tactic especially using a Regista in the 4-3-3 or 4-5-1 formation. 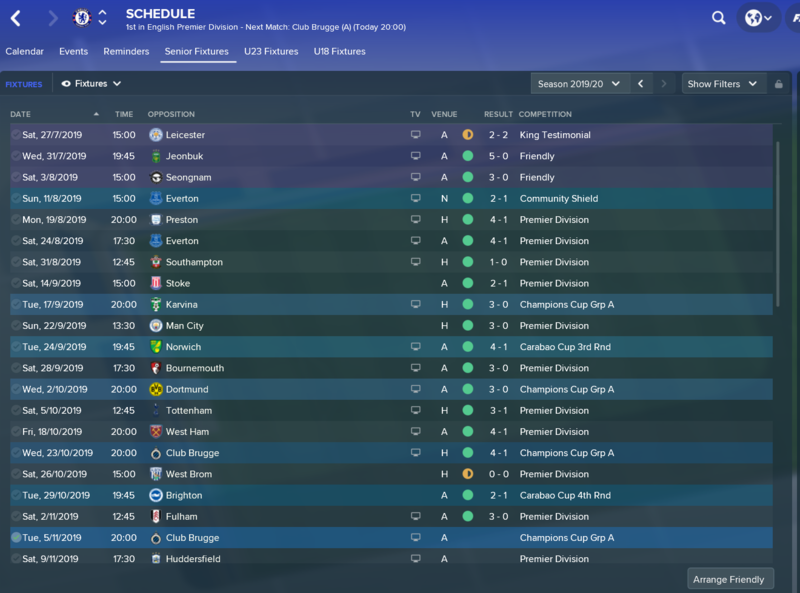 After a lot of trial and error and almost giving up, I have stumbled upon a ridiculously beautiful tactic. My only gripe is that the possession hovers around the 55-60%. Other than that this is the most beautiful football I have ever seen in FM match engine. Please give it a try and comment your results and findings. Before December, I was using a mix of a different 4-3-3 and 4-2-3-1, but I was not satisfied. So instead of a minor tweak, I revamped the roles and the team instructions. My season is going on and it seems to work really well. This save is in my second season at Chelsea as you can see in the transfers. 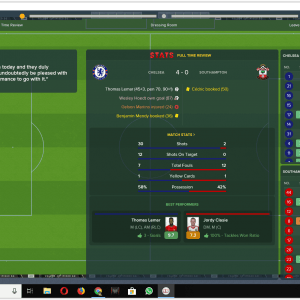 Please note: This is not an overachiever tactic but my sincere approach to replicating a realistic interpretation of Sarriball﻿﻿ (Chelsea version and how they play in real life). You will need good enough central midfielders and regista to make it effective. 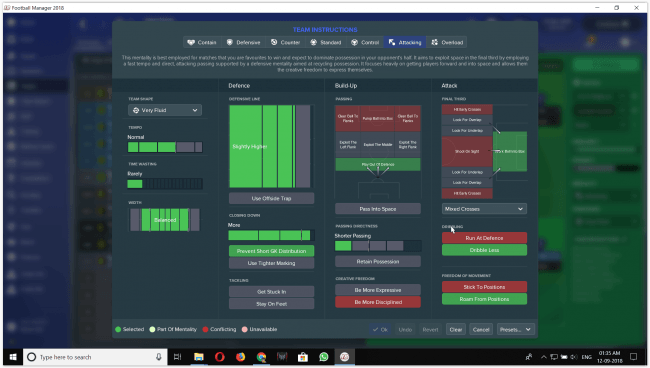 Although effective, I feel the regista is not properly utilized by the game as in real life; the team is not focusing enough on him, but hey, let's hope it is better in FM19. I also used a corner tactic from another person, but that does not contribute much. 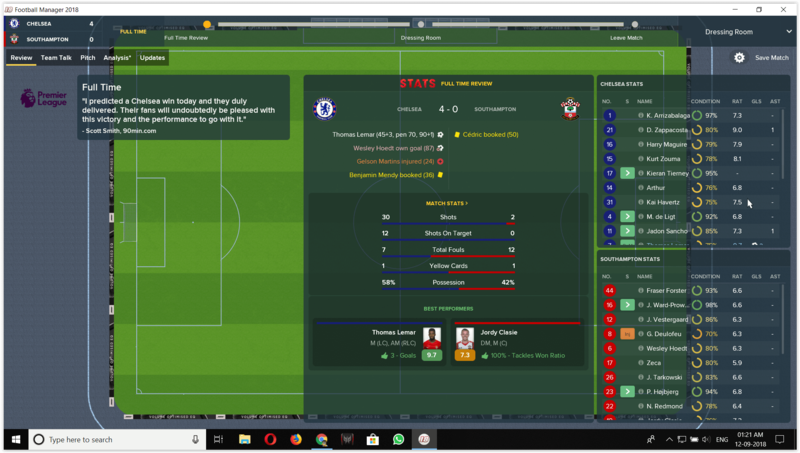 In league cup and FA cup, I usually use fringe players and youth. Somehow Leicester seems to be my Achilles Heel. Other than that we look fine. I don't use OI as I want it to be plug and play. I feel that PIs make it less interesting so I don't use them. Training is balanced (average intensity), focus on attacking after formation is fluid. Short passing is to retain possession. For attackers: One twos, killer balls, beats offside trap. Here are two goals that we have scored in the Champions league semi final first leg. This tactic is purely the result of trial and error. Initially I made it standard and control with flexible/fluid. But the thing is that the movement of the players was pretty unrealistic and static, especially when the other team has possession. We always try to implement high pressing, defending in the opponents half (most of the popular tactics I've tried) but with the previous settings, they don't cover the open positions/zones left by the teammate who closes down the opponent. It had me furious at many games with something so obvious yet the AI (of our team) decides not to move. 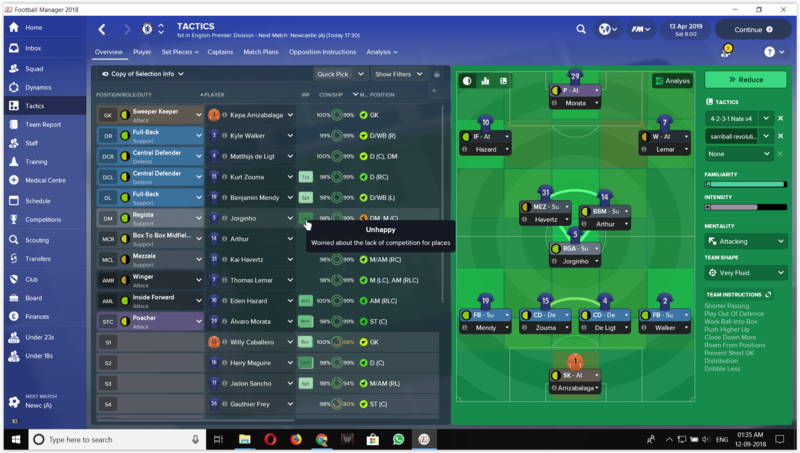 So I went all out and just tried an attacking tactic with that was fluid with roam from positions to cover any empty spaces and hope for a total-football esque game. At that point I didn't even care if it worked because I was already frustrated at the ME. But it turned out pretty well as it unshackled my players to move and cover for the others. I also made them dribble less as I wanted a more tiki taka in the mix. I know a lot of people say that these instructions are not necessary as the roles of some attacking players have them, but after a lot of trial and errorIi found it actually worked for me in this tactic with this formation and these roles. Even the poacher, which in other formations usually is a selfish player, in this tactic worked really well. He is quite the creator for the winger and inside forward. The regista is regista, we all know. Not the main creator in my tactic. But the dictator as in the current Chelsea. He is responsible for the movement of the ball in the midfield. I chose mezzala because I want the player to move vertically when the inside forward is cutting inside so that there is an open space in the wing. For the other central midfielder I chose a box to box player as I find his movements realistic and fitting with my formation and also due to the fact that it really clicked well. With these roles and instructions, the pressing of my players is now realistic and pretty effective. I specifically did not want to use sitter roles with defend instructions as it makes the player hugely immobile thus not helping in possession nor pressing. The main source of key passes are the midfield duo and the wingers. These four players send crosses and key passes all over. I highly recommend that you don't tweak the tactic. Make it fluid and let it run its course, you'll be entertained. 6 comments have been posted so far. 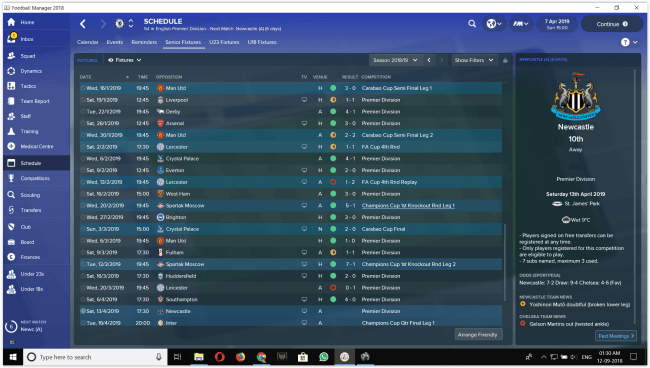 first season was a mix of 4231 and an earlier version of sarriball. it was'nt satisfactory and this formation was a result of the tweaks and reworks. I'm doing another save of Chelsea. will share it at mid season. Yes, like you've made it. Playing with AC and Rudiger until I get better players ... Can I see your team in the first season? Do not know what I'm doing wrong. Is your tactic fluid? How about your central defenders? Since we are pressing high up, we need to use quick defenders with at least 13 acceleration and also good anticipation and positioning. Seems it works well at home. But do many matches lose away?